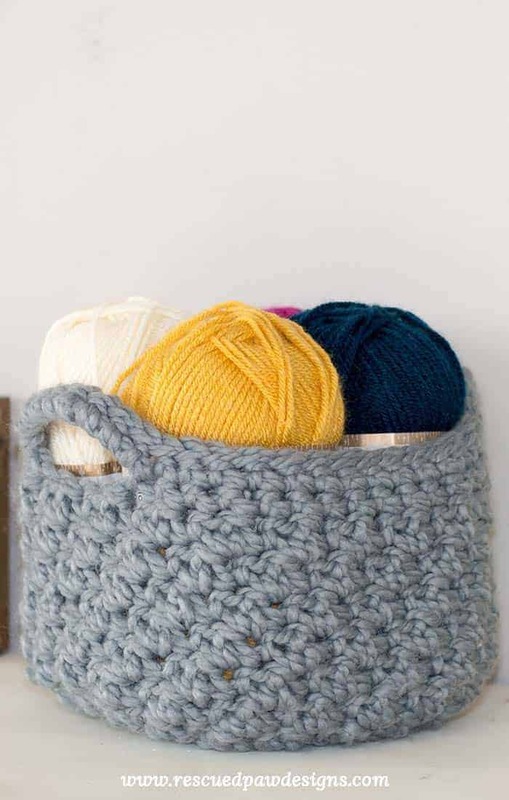 Use this crochet storage basket pattern to store all your extra yarn in and more! Learn how to to crochet a basket today! If you are in need of some dire spring cleaning solutions then this crochet basket pattern is for you! OK. I guess I should rephrase that.. 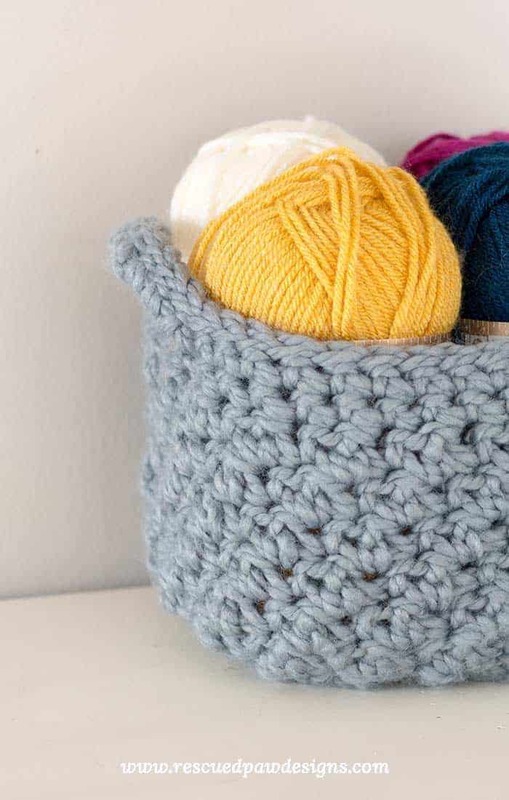 If you are in need of some yarn spring cleaning then this crochet storage basket pattern is for you! More yarn storage equals a happy mamma! Am I right? This basket is super easy to work up and is great for beginners! 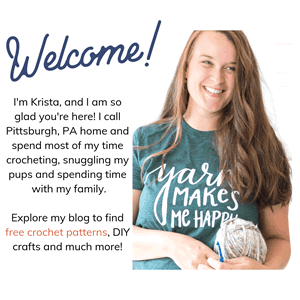 If you have a every growing yarn stash and need a little help getting it under control then keep on scrolling down to find the free easy crochet basket pattern! 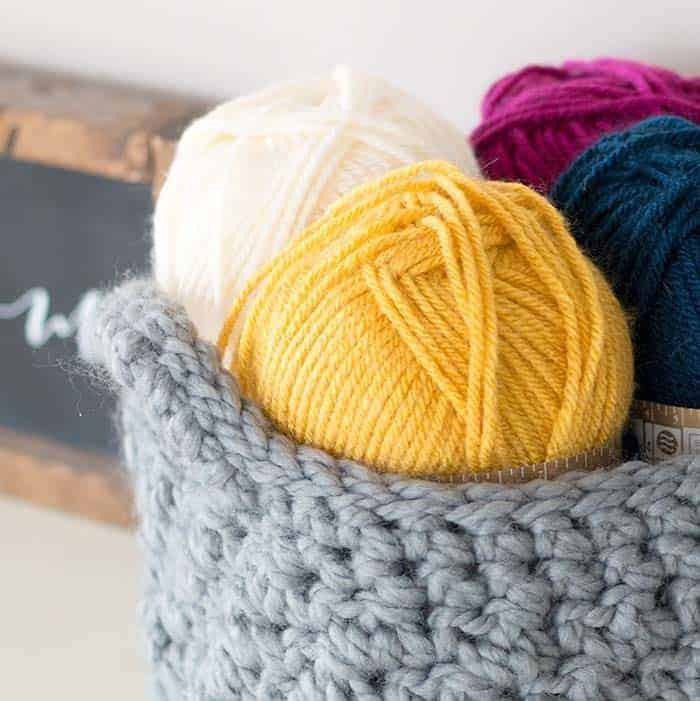 The Yarn that’s perfect for crochet baskets! To make this storage basket just like mine you will need approximately 220 yards of Lion Brand Wool Ease Thick & Quick in Slate. A 9 mm crochet hook (any brand will work! ), yarn needle an scissors. I love my Lion Brand yarn needles but again any brand will work! If you use only one skein at a time you will get a looser not as sturdy basket. That was OK with me because I am using my basket for my yarn stash and it didn’t have to be quite as stiff. If you are wondering how to stiffen a crochet basket then I can help! 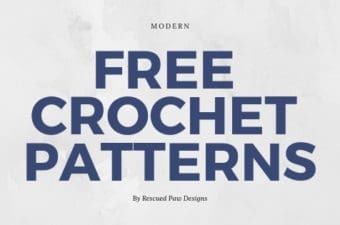 You May Also like these crochet patterns…. 3 stitches for every 2 inches of the crochet basket. Approximately 6 inches high (not including handles) and a 24″ circumference. Round 11: ch 1, starting in first st sc, sc in next 7 st’s, ch 8 (handle), sk 3 st’s, sl st in next st, sc in next 15 st’s, ch 8 (handle), sk 3 st’s, sl st in next st, sc in next 7 st’s, sl st to top of first sc. Round 12: ch 1, starting in first st sc, sc in next 7 st’s, 8 sc in the ch 8 space (handle) from previous round, sc in next 15 st’s, 8 sc in the ch 8 space (handle) from previous round, sc in next 8 st’s, sl st to top of first sc. Round 13: Ch 1, Turn your work and work back in the same direction around the basket you came from doing a sl st in each st around. Fasten off yarn and weave in loose ends with a yarn needle throughout. That’s it! You made your very own basket and now you have even space to store your yarn stash! Let me know what you think and if you have any questions please feel free to shot me over an Email. 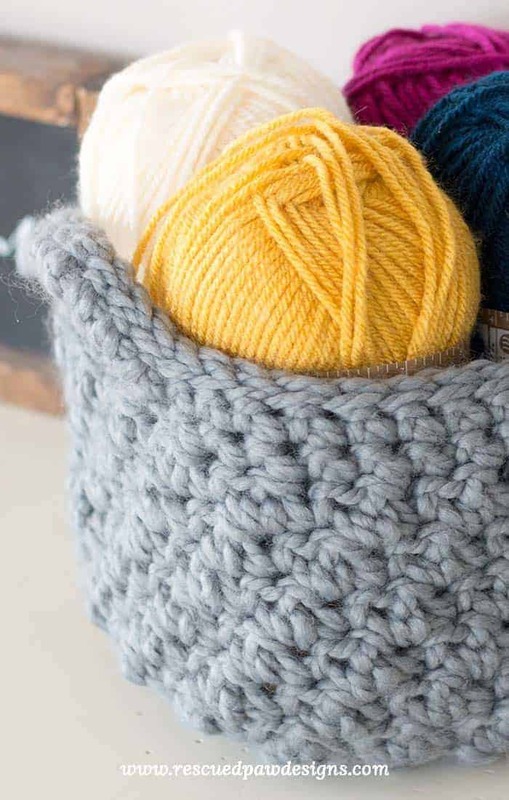 If you are more of a video person you can find the full tutorial for this free crochet storage basket pattern on YouTube ! This looks great! 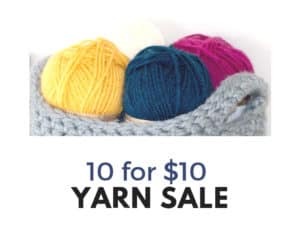 But I have one question… are the directions provided to be made with two strands of yarn at the same time or just one? Or will it work for either, depending on the stiffness of the basket you want? Thank you! 🙂 The pattern will work with either 1 or 2 skeins. 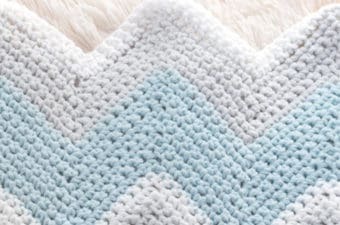 🙂 I made it with one because I only needed it for yarn but if you’d like to use it for something that won’t hold up the sides I’d suggest using 2 skeins of yarn. I love idea of making this basket. I have SO MANY skeins of yarn though and am wondering if using two skeins of regular yarn would work instead of using thick and chunky? Hi, the basket looks great. I want to make a bigger basket, what should I do in consideration of the pattern? Thanks for sharing this pattern. I’d like to make it taller, how can I adjust the pattern? My first time making a basket so I’m a little hesitant. You could add a few rows after row 10 then start with row 11 as written when you get it as high as you want. Thank you for this beautiful basket pattern. 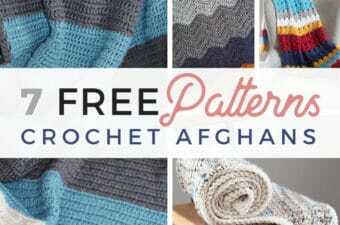 I just purchased some sale chunky yarn and am anxious et going with this new pattern. I love that your patterns are free. Thanks again. You are welcome Jan! Happy Crocheting! Love this basket pattern! Thank you so much for sharing it! Actually, I love most of the patterns that you design! Thanks Lisa! I am so glad you liked it!